The preseason has officially come to an end and Week 1 is near. Before we get started on previewing the open week of 2018 fantasy football action, we’re taking one quick run through all of the divisions with some last-minute fantasy quick hits. We’ll offer up a fantasy value, bust, and sleeper along with some rookies to know and dynasty quick takes for each team. In this edition, we examine the AFC South. 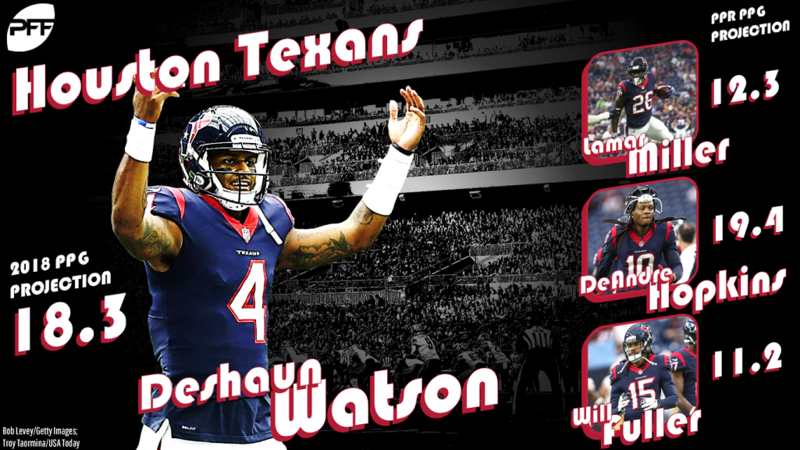 In 2017, with Deshaun Watson under center, we were given a fleeting glimpse of what could be in the cards for 2018. While starting last year, Watson was fantasy’s No. 1 quarterback with 20 total touchdowns in just six games. That insane level of production has people wide-eyed at the potential of this offense, but is it a trap? The Texans did not lose any key parts of the offense, and their team as a whole will get a boost with the return of J.J. Watt. As a result, fantasy expectations in Houston are as high as they’ve been since the height of the Arian Foster and Andre Johnson days. Best fantasy value: Lamar Miller, RB — Miller was a solid RB2 last year (No. 16 overall) who put up tail-end RB1 numbers while Watson was healthy (Miller had 524 total yards and four touchdowns in those six games). Fantasy bust: Deshaun Watson, QB — Watson has the legitimate potential to finish as the top overall fantasy quarterback this year, but he was drafted at his ceiling, which makes bust potential far more likely. Rookie(s) to know: Keke Coutee, WR — Coutee will push for targets out of the slot in Houston. Best current player for their 2020 roster: DeAndre Hopkins, WR — Hopkins will still be in the thick of his prime in 2020 as he enters his age-28 season. The 2018 Colts have nowhere to go but up. With Andrew Luck sidelined last year, the Colts finished 31st in total offensive yards (284.6 per game) and 30th in points scored (16.4 per game). 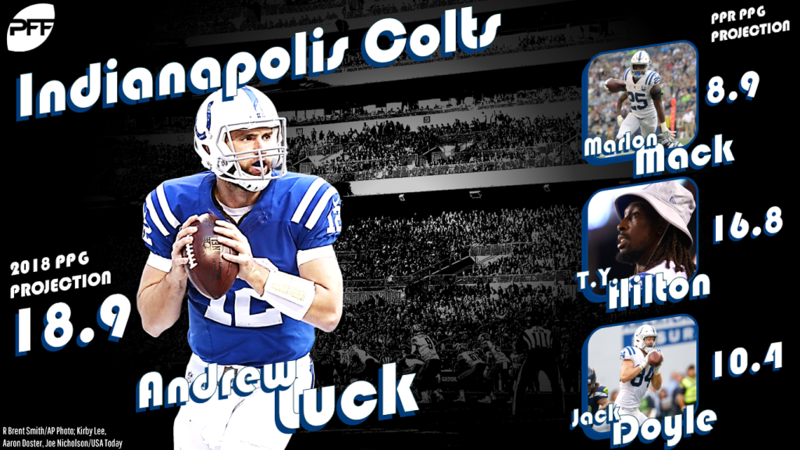 Luck’s return will give this offense a needed boost, but outside of Luck and veteran wideout T.Y. Hilton, there are more questions than answers from a fantasy perspective. Best fantasy value: Andrew Luck, QB — Here are Luck’s overall fantasy finishes when he’s played since entering the league in 2012: QB8, QB7, QB1, QB1 (pace), QB4. Fantasy bust: Marlon Mack, RB — Mack is hobbled to begin the year, which will open the door for rookies Jordan Wilkins and Nyheim Hines to wrangle carries away from a backfield that was already destined for committee status. Sleeper to watch: Eric Ebron, TE — In the preseason, Ebron made a case to be a regular contributor during the regular season, as he caught nine of nine targets for 70 yards and a score. Rookie(s) to know: Jordan Wilkins and Nyheim Hines, RBs — Neither player was impressive in the preseason (Wilkins averaged 2.8 YPC; Hines averaged 1.5), but in an unsettled backfield, these rookies will vie for touches. Best current player for their 2020 roster: Luck — Luck will be 30/31 during the 2020 season with plenty of gas left in the tank. Jacksonville surprised everyone in 2017. Not only did they smother opposing offenses with the league’s best defense, but their offense was surprisingly productive as well, as Jacksonville put up 26.1 points per game — fifth in the NFL. 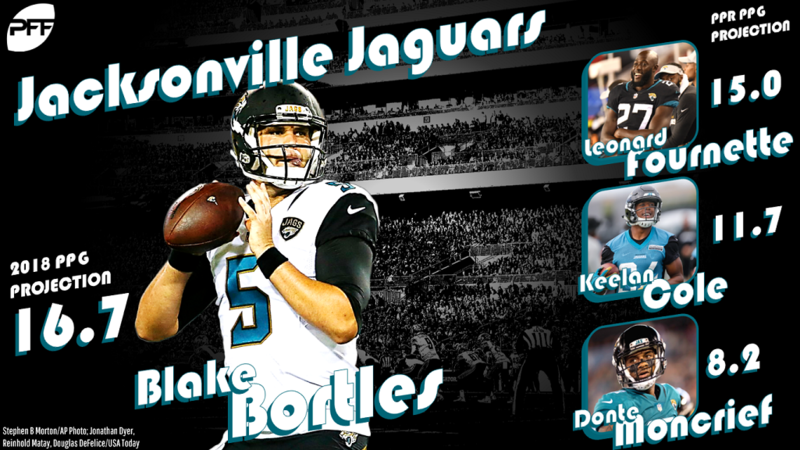 The team will once again the spearheaded by running back Leonard Fournette, but the shaky hand of Blake Bortles keeps Jacksonville from being an obvious slam-dunk from a fantasy perspective. The team’s value took a hit when leading wideout Marqise Lee suffered a season-ending injury in the preseason, but there is plenty of depth still at the wideout position. We know Fournette and the Jaguars DST will produce big fantasy numbers, but the question is: Will anyone else? Best fantasy value: Leonard Fournette, RB — Fournette may have been a tad too pricey for my liking as a late-first-round fantasy pick, but he is far and away Jacksonville’s best fantasy asset as a strong RB1. Fantasy bust: Dede Westbrook, WR — Opportunity presented itself for Jacksonville receivers once Lee went down, but this is a run-first offense and Westbrook isn’t the top receiving option, which will make him nearly impossible to trust on a weekly basis. Sleeper to watch: Austin Seferian-Jenkins, TE — Seferian-Jenkins caught 50 of 71 targets (70.4 percent) for 357 yards and three scores as a member of the Jets last year, and he provides Jacksonville with a new red-zone threat other than Fournette. Rookie(s) to know: D.J. Chark Jr., WR — The wideout room in Jacksonville is crowded, but Chark possesses an excellent combination of size (6-4) and speed (4.34) that could earn him playing time. Best current player for their 2020 roster: Fournette — Fournette was the No. 8 running back in fantasy last year despite missing three games. He’s going to be a fixture in the top 10 for years to come. 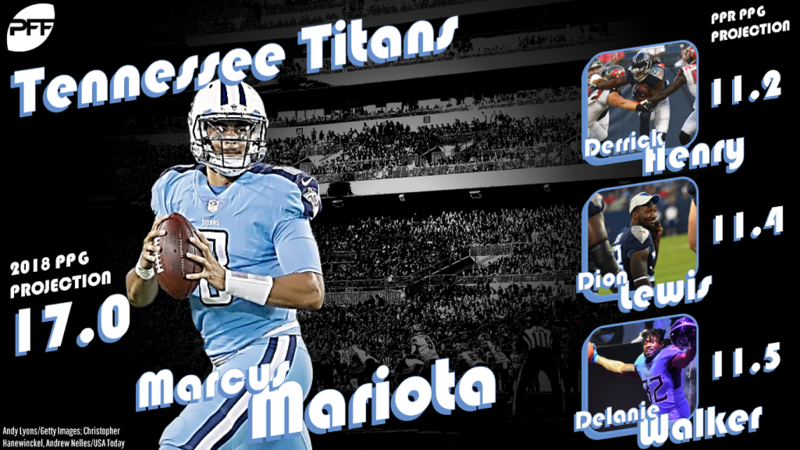 The Titans offense has a talented young core in Marcus Mariota, Derrick Henry, and Corey Davis coupled with strong veterans in Dion Lewis, Delanie Walker, and Rishard Matthews. From a fantasy perspective, the Titans have all the pieces of the fantasy. But with a new head coach and a new offensive coordinator, it’s a wait-and-see approach to see if the team can put it all together. The ceiling is sky-high for this unit, but some inefficient play in the preseason has people worried. Best fantasy value: Dion Lewis, RB — If preseason usage is any indication, Lewis will be on the field often for the Titans and he should put up tail-end RB2 numbers in PPR leagues. Lewis had 11 touches this preseason (six receiving, five rushing) while Henry had 12 (11 rushing, one receiving). Fantasy bust: Derrick Henry, RB — Henry was slipping into the second round of some drafts, but this backfield is looking more and more like a committee, and it wouldn’t be a surprise to see Lewis outscore Henry. Sleeper to watch: Corey Davis, WR — Injuries plagued Davis’ rookie season, but we got a glimpse of his potential in the postseason when he lit up the Patriots in the Divisional Round with a line of 5-63-2. Rookie(s) to know: Cameron Batson, WR — Batson made the 53-man roster after going undrafted this year. He saw a team-high 14 targets this preseason. Batson faces long odds to make an impact in 2018, but he’s a name to tuck away. Best current player for their 2020 roster: Marcus Mariota, QB — Mariota’s rushing ability gives him a tantalizing ceiling. Come 2020, Mariota will still be just 26 years old. He could be hitting his stride with Henry and Davis to form a deadly fantasy trio.